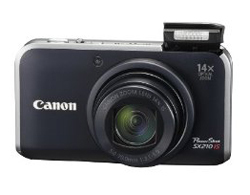 Photography Blog has reviewed a new compact digital camera from Canon called Canon PowerShot SX210 IS. This camera has some impressive specifications with 14x wide angle optical zoom and 14 megapixels. Photography Blog ends up giving the Canon PowerShot SX210 IS a “Recommended” rating with 4 out of 5 possible stars. The camera scores highest on design, features, image quality and ease of use while scoring a bit lower on value. Overall this seems like a good travel camera with many good qualities. If you can live with the high price tag the SX210 IS might be a good option. Read the full review of the Canon PowerShot SX210 IS digital camera here.